Mafia II is a "buddy story," in the words of Producer Denby Grace – a tale of a mid-50s era mobster protecting his family and The Family in the face of organized crime. For the world's first look at the game, 2K Games demoed a single mission about halfway through the game's branching storyline. Vito and his number two guy – think Tommy DeVito from Goodfellas, only twice actor Joe Pesci's size – are trying to take out a mob boss during a business meeting in a high rise hotel. The plan involves disguises, explosives and young getaway driver, Marty, who's itching for a chance to shoot somebody. At the risk of spoilers, let me just say it didn't go down well for our heroes. The whole thing was over in 20 minutes and left off on kind of a downer. But it was the perfect way to showcase what Grace calls the three main elements of Mafia II: an authentic city with a strong narrative and intense gunplay. Mafia II straddles 10 years of time in a city that looks an awful lot like New York between the 40s and the 50s. The game is broken down into flashbacks that weave between the two time periods and tell the story of Vito, the son of a young immigrant out to capture a piece of the American Dream. If this plot sounds familiar, that's because the writing team – same guys who penned Mafia I – stuck to their Goodfellas inspirations to craft a tale of loyalty, revenge and corruption in the mob syndicate of America. 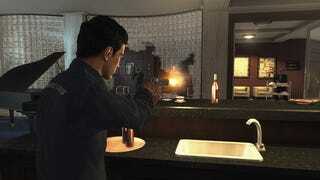 Exact story details were sketchy in the one mission 2K showed; most of the story in the "Room Service" mission the developer demoed was told through in-game conversations between characters, as opposed to theatrical cut scenes. Room Service started out with a 50s-era car parked along the side of a road. In a short cut scene, Vito shows up and chews Joe out for inviting noob getaway driver Marty along on the mission. Then the gameplay starts with the player having to drive the car to a fancy high rise hotel. Grace took this downtime in the game to talk about the car radio in the game as atmosphere. Sounds like you won't get to fiddle with it; depending on where you're driving and what time, the game decides what you're listening to and this somehow will contribute to whatever setting you happen to be in. Damned if I got any impression of that during this demo, though. The debug Xbox 360 chugged like a frat boy as the car moved through the giant sandbox-ish city (remember – Mafia games are unlike Grand Theft Auto in that the sandbox is built around a linear story instead of the other way around). According to Grace, there are no loading screens in the game, so I expect the new Illusion engine has a lot of work to do in these early pre-alpha builds. Joe announced the trap was set and the demo master steered Vito out of the conference room – blood stain still conspicuously un-cleaned. But I guess you can't count on NPCs to act completely realistically, whatever Grace promises; unless you'd rather suffer a carpet-cleaning minigame. But, Grace did say that the mob boss's goons would start shoving you around if you dared walk too close to the mob boss – or just stood around too long, so there's all the realism you need, right? Back to the plan that will never work. Vito and Joe made their slow way up to the roof via the stairs. I found myself wondering if boredom counts as immersion, or if the developer was trying to avoid rendering cut scenes by having these lengthy in-game nothing-is-happening-so-let's-chat sequences. The dialog between the two mob buddies was amusing, I suppose – but for someone who's seen Goodfellas half a hundred times, it was nothing special. Once on the roof, a short cut scene showed two mob goons hanging out on the roof hocking loogies at pedestrians down below; Joe gives Vito a gun and the game lets the player take control again. Grace took a moment to explain that you had a choice in resolving the issue of expectorating goons. You could be non-violent and go back the way you came, skirting around a different path to the other side of the roof, he said. But because that third element – the intense gunplay – hadn't had the limelight yet, of course our demo master opted to shoot the place up. I'm not familiar with the melee and gunplay system in Mafia I, other than hearing that it was broken, so forgive me if I make stuff sound new that's old. But what I saw was a cover system, over-the-shoulder aiming, regenerating health, almost now heads-up display icons (besides a targeting reticule) and tactical AI that also uses the cover system. It looks like you can knock enemies out of cover with a careful shot to the knee or the shoulder – but what you really want to do is score a headshot before you take roughly three or more hits and die (sort of like you would in real life). According to Grace, this combat system is very much improved over Mafia I – and again, being that this build is pre-alpha, it's probably only going to get better. I'm just pleased that there's a shotgun you can pick up after offing the enemies on the roof. With the goons shot up, our heroes then bound and gagged the real window washers and stole their ride. Yet again, we got the nothing's-happening lull in action – but this time at least you could ogle the city on the ride down to the conference room. Once down by the conference room, you could turn and look inside – which later causes problems with Grace's realism claims. Once the wires were connected, the game entered a cut scene showing the scaffolding ascending the hotel. Then suddenly – gasp! – the bomb went off early, shattering the window right below our heroes' feet. Joe took the scaffold back down to have a look at their handiwork and – surprise, surprise – the mob boss wasn't dead. He stumbled out of the bathroom, wondering aloud (rightly so) what the hell just happened. Here's where where the realism falls apart for me: if you could look into the conference room, wouldn't you have seen that the boss wasn't there? Or if he was – do you really expect gamers to believe that in the three seconds' lapsed time between the wiring of the bomb and the cut scene showing the bomb going off that the mob boss could have gotten up from the head of the table and made it all the way into a toilet stall? Whatever. The game resumed with Vito and Joe inside the blown-up conference room in hot pursuit of the mob boss. We got to see more of the gunplay and that shotgun came in handy as Joe and Vito shot their way past mob goons, innocent passers-by and room service carts to get to the elevators, get down to the basement and get into the getaway car. Another short cut scene informed us that Marty was dead (big shocker) and then the game resumed with Vito and Joe in their getaway car in pursuit of the mob boss's getaway car. The Room Service mission was over and Grace ended the demo with a little Q&A. The take home points he had for the media are that Mafia II is a game that will be more polished than Mafia I, with a better combat system and supposedly a better police system (which we didn't get to see). He also stressed that while this is a sandbox game in terms of size, it's still a linear story that the player is following to one of the possible four endings. So while there are what you'd call "side quests" where you're building your mob reputation by "helping" people, the progression of the story is not measured in persistent day and night cycle. Everything feeds back into the fiction, Grace said, describing how police interference would actually go down over the course of the game as you gained more mob influence because you'd presumably have cops on your payroll (his words, not mine). I'm not sure precisely how this "sandbox with structure" will work since we weren't shown a time jump between the 40s and the 50s. Grace tried to describe it with an example where, if you did a mission that brought a lot of heat to you or your crew, the game wouldn't just pick up the next day with you guys doing the same old thing. You'd have to hide out for a while and the game would move forward in time to a couple of weeks or months later, when things had died down. Overall, I'm optimistic about Mafia II based on what I saw. The span from 1944 to 1950-something may not be as exciting as mob life in the Prohibition era, but it's still a change of pace from the Grand Theft Auto and Godfather games. I like zoot suits and shotguns and Cadillacs; I'm sick of cell phones and movie tie-ins and annoying cousins that want to go on man-dates. So even though I haven't played the first game, there's probably something for me in Mafia II. I just hope it doesn't involve too many more nothing's-happening moments than what I saw in Room Service.